Nancy Tandon • This entry was posted in Middle Grade Fiction, Parenting, Reading, Tweens and tagged Chronicle Books, Megan Jean Sovern, middle school, Multiple Sclerosis, Sibling Rivalry. Bookmark the permalink. 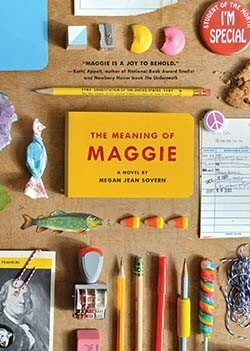 I really enjoyed your review of “The Meaning of Maggie.” I love her spunky character already! And the book has all the elements that I like in realistic ficition. My kind of book. May have to get it and review it at a later. I love to share books about how families deal with a chornic illness in an upbeat way. GREAT, GREAT review! Pat, I actually thought of you when I was reading it. I think we have very similar taste in stories. *Great minds think alike*! I bought The Meaning of Maggie for the title and cover alone… it was a name we considered for both our daughters. I love that you hook the reader in to your review by mentioning other popular, beloved characters of younger students… this will help me recommend it to the older students in my elementary library. I had a similar draw – Maggie is my niece’s name. Nice to connect with you, too!